A curtain of military censorship is preventing physicians, medical researchers and South Korea’s public health officials from accessing information needed to halt the Middle East Respiratory Syndrome (MERS). The nation’s first MERS infection was pinned on an 68-year-old Korean businessman who returned to his native Gyeonggi province, 40 km south of the capital Seoul, after visiting an undisclosed location in the Mideast. This first patient remains anonymous and out of reach of the public eye. Ignored in the worldwide media hysteria is a trail of evidence linking the MERS pandemic to virus research under the Pentagon’s biological warfare program. The following facts indicate the South Korean pandemic, which started in late May, may have been caused by a laboratory accident at the JUPITR biowarfare project at Osan U.S. Air Force Base, 40 km south of Seoul. This writer’s opinions are bracketed. The WHO has abetted the spread of airborne pathogens by failing to promote Indoor Air Quality recommendations from Hong Kong doctors for hospitals, clinics, senior homes and schools. As in the prior situation of SARS, the spread of MERS-CoV increases exponentially with virus-load concentrations within an indoor environment. What’s needed are the redesign of medical facilities to prevent aerial transmission among patients and medical staffers, and generation of free-radicals to destroy infectious particles inside titanium dioxide air cleansers. The spread of MERS inside four Korean hospitals is a reminder of how during the SARS outbreak WHO Director Margaret Chan stubbornly opposed hospital redesign in Hong Kong, thereby revealing herself to be a corrupt promoter of lucrative vaccine research by major pharmaceutical corporations. The hard-learned lessons from the 2002-04 SARS pandemic in Hong Kong and southern China apparently never reached Seoul or Geneva. The secrecy of its virus institute along with a Biosecurity program for research labs is transforming the WHO into an appendage of the Pentagon and NATO. Its flagrant violations of medical ethics have spurred calls for sweeping reform. WHO served as an acquiescent partner in the deliberate planting of a modified Ebola virus in mineral-rich West Africa, as reported in this author’s seven-essay series, and the spread of MERS in the oil-producing Gulf States. South Korea is today the WHO center for virology due to the lasting legacy of militarist Japan’s special-weapons group Unit 731. Decades ahead of the US and Britain in virus research, the Japanese military isolated highly contagious Hantavirus in occupied Manchuria during the late 1930s prior to the invention of the electron microscope. The innovative virus program was kept top-secret by disguising it under long-established bacteriological studies of bubonic plague. The viral weapon was deployed against Chinese cities, resulting in the deaths of untold masses of civilian residents and at least 2,000 Japanese soldiers in contagions that spread far more quickly than bubonic plague. At war’s end 70 years ago, virologists with Unit 731 were cordially invited to continue their deadly research at the U.S. Army’s biowarfare lab at the Dugway Proving Ground. Although vigorously denied by the CIA, on-the-ground witnesses during the Korean War assert that biological agents were dropped from clandestine nighttime flights over the Chinese side of Yalu River valley. On a visit to northern China, one of the surviving civil-defense volunteers told me about cleaning up bundles of straw containing horse hair and rat droppings. His account was consistent with murine (mouse-borne) Hantavirus, which is spread through rat urine and feces. Hantavirus proved difficult to control, however, resulting in the deaths of more than 3,000 American soldiers along the Han River (the namesake of Hantavirus), making it among the most lethal self-inflicted errors in the history of warfare. Long after the end of the Korean conflict, Hantavirus continued to kill Americans, including native Indians in the Four Corners region and, more recently, tourists in Yosemite National Park. Ecology-specific pathogens are developed under geopolitical strategies for specific regions. The UAE is the sole Arab state to participate in the WHO International Vaccine Institute in Seoul, while Israel and ally Turkey take a leading role. Meanwhile, Saudi Arabia and China have cooperated to decode camel DNA, the first step in the quest for camel antibodies that can resist MERS. The world is locked in a clandestine biological war to either attack or defend entire populations and capture the resources of a region. Over the past decade, successive outbreaks of gene-modified SARS, avian influenza, ebola and MERS have had the effects of economic sabotage and terror over national populations in concerted attempts to put public-health systems under Western control. The U.S., Canadian, Australian, European and Japanese response is invariably refusal to admit the obvious. 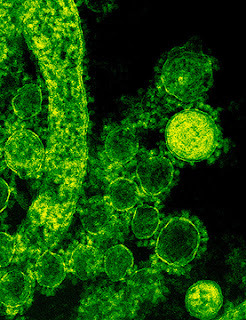 A forensic investigation into the source of Korean MERS is urgently needed. The likelihood of a fair scientific inquiry is, however, practically nil. The government in Seoul is already totally compromised by its blanket cover-up of the likely scenario that the Sewol ferry sinking was caused by an underwater collision with one of the South Korean Navy’s new Dolphin-class submarines built in cooperation with Israel Shipyard Industries. With MERS, its credibility is sinking to new depths. Forthright answers to the real cause of the MERS outbreak will not readily emerge out of militarist-minded Seoul or from Washington, meaning Arab nations must prepare for worse to come while innocent Koreans continue to lose their lives in collateral damage. Science journalist Yoichi Shimatsu led a public health information team during the SARS outbreak in Hong Kong and avian influenza contagion in Thailand.